Left ventricular pseudoaneurysms are not an uncommon occurrence in adults and are usually secondary to ischemic heart disease. Their occurrence in children is rare. The commonest causes in children include infection, previous cardiac surgery, and trauma. We outline the clinical presentation and management of a 17-month-old girl with pseudoaneurysm presumably secondary to purulent pericarditis. A 1.5-year-old girl was admitted with history of fever, vomiting, and loose stools for 5 days at a hospital elsewhere. She was irritable and febrile, but physical examination was unremarkable except for the presence of a pericardial rub. Investigations showed neutrophilic leukocytosis, hypochromic and microcytic anemia, and a high C-reactive protein (CRP). Chest X-ray was normal and an initial echocardiogram was normal. She was treated with intravenousantibiotics and zinc supplementation. Her initial blood culture grew a methicillin-sensitive strain of Staphylococcus aureus. The girl had been started on vancomycin after the preliminary blood culture reported Staphylococcus aureus. She continued to remain febrile with no improvement in blood counts and acute phase reactants. There were no additional localizing signs. A repeat X-ray, 5 days after hospitalization showed cardiomegaly and the echocardiogram showed a pericardial effusion. She was then referred to our center for further management. On admission at our center, she had fever with disproportionate tachycardia, tachypnea, clear chest, and a just palpable liver. All peripheral pulses were palpable and her blood pressure was 84/52 mmHg. There was no pericardial rub or any other localizing signs. Echocardiogram showed an organized collection in the pericardium with fibrinous septae and no evidence of tamponade. Blood counts, erythrocyte sedimentation rate (ESR), and CRP were high. A diagnosis of pyopericardium was made and a pericardiectomy was planned. Antibiotic therapy was continued. She underwent pericardiectomy through a median sternotomy on the 2 nd day of hospitalization under general anesthesia. On opening the pericardium, an adherent, grayish-white material was found encasing the entire heart, all of which was removed [Figure 1]. On transesophageal echocardiography (TEE) during surgery, a diverticulum was noticed in the left ventricle just below the posterior mitral leaflet communicating with the pericardial cavity [Figure 2]a and b. 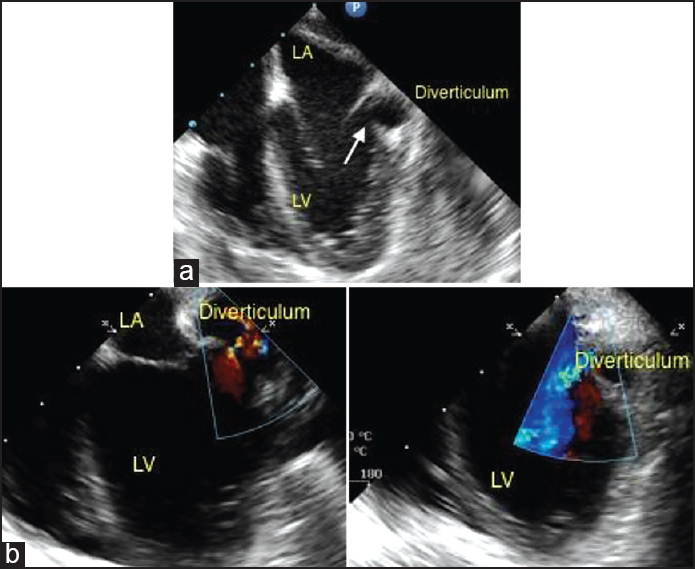 A probe in the pericardial cavity confirmed the presence of the diverticulum. The diverticulum was not specifically addressed during this operation because the focus was on draining the pus in the pericardial cavity, the tissues were extremely friable, and the general condition of the patient was poor. It was hence decided not to subject the patient to cardiopulmonary bypass; the diverticulum was to be dealt with at a later date. Hemostasis was secured and the chest closed in layers. The postoperative recovery was initially uneventful. She was electively ventilated overnight and extubated the next morning. No inotrope support was necessary. Pericardial drains were minimal and the pericardial and mediastinal tubes were removed within 48 h. There were no fever spikes postoperatively, but her acute phase reactants continued to be positive. Postoperative echocardiograms confirmed the presence of a diverticulum from the left ventricle to the pericardial cavity. Blood culture and cultures of the purulent material were sterile and histopathological examination was consistent with an acute inflammatory reaction. On the third postoperative day, she was noticed to become unresponsive suddenly while playing with her mother. There was hypotension and peripheral pulses were not palpable. Heart sounds were muffled. Echocardiogram showed a large collection in the pericardial cavity causing cardiac tamponade. She was aggressively resuscitated with intravenous crystalloids and emergency needle pericardiocentesis was done using a 20 gauge intravenous cannula inserted percutaneously under echocardiographic guidance. Fifty milliliter of blood was withdrawn from the pericardial cavity. Cardiac contractility improved and pulses reappeared immediately after the procedure. She was then taken up for an emergency sternotomy, which revealed large amount of blood clots in the posteroinferior segment of the heart suggestive of a contained rupture. Emergency cardiopulmonary bypass was established by aortic and bicaval cannulation. Antegrade cardioplegia was delivered through the aortic root. The interatrial groove was dissected and left atrium was opened. The exposure was not adequate, hence inferior vena cava (IVC) was transected and the left atrium incision was extended inferiorly. 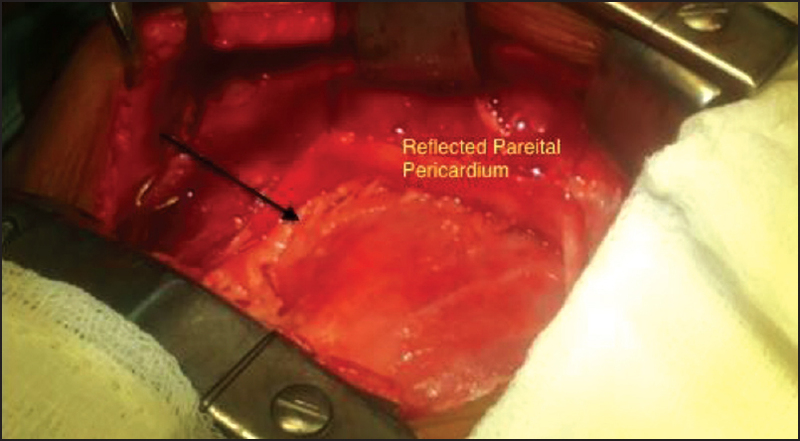 The posterior mitral leaflet was detached and a 4-mm opening communicating with the pericardium was identified and closed with gluteraldehyde-treated pericardial patch secured by continuous sutures. The cavity was further closed with additional patches from the pericardial surface to prevent further bleeding from the cavity. The postoperative recovery was uneventful. She was treated with intravenous vancomycin for a total of 14 days and discharged on oral linezolid for a total period of 28 days. At follow-up 2 months after the procedure, she was asymptomatic with no clinical or laboratory evidence of persisting infection and had normal cardiac function with no mitral regurgitation on echocardiogram [Figure 3]. The pericardium is rarely a primary focus of purulent infection. It is usually involved through embolic seeding or by contiguous spread from the pleural cavity. Staphylococcus aureus is the commonest cause of purulent pericarditis in the current era. It is a virulent organism capable of causing extensive tissue destruction. We hypothesize that the spread of infection from the pericardium lead to localized myocardial rupture which was immediately temporarily sealed by the organized pericardial collection leading to pseudoaneurysm formation. After the initial pericardectomy, the pericardial wall of the pseudoaneurysm became less stable leading to hemopericardium and cardiac tamponade. Medical management is usually not advised in pseudoaneurysms secondary to infection because of an unacceptably high risk of rupture, cardiac tamponade, and death. In hindsight, closure of the pseudoaneurysm should have ideally been accomplished during the first surgery. Early surgical series of pseudoaneurysm have reported a surgical mortality of approximately 20%, which was still significantly lower than that of unoperated pseudoaneurysms. Recent advancements in surgical techniques have ensured a very good outcome in most patients who undergo surgery. Simple closure of the defect in the myocardium will correct the problem with a very low risk of recurrence. Further obliteration of the pseudoaneurysmal cavity using additional patches decreases the likelihood further. In conclusion, the risk of myocardial infection leading to pseudoaneurysm should be kept in mind while managing all patients with purulent pericarditis secondary to a virulent organism. A careful transthoracic echocardiogram will diagnose most cases of pseudoaneurysm in children. There is no role for medical management and all patients should undergo surgical closure of the myocardial defect. The results of surgery are uniformly good with a negligible risk for recurrence. Davidson KH, Parisi AF, Harrington JJ, Barsamian EM, Fishbein MC. 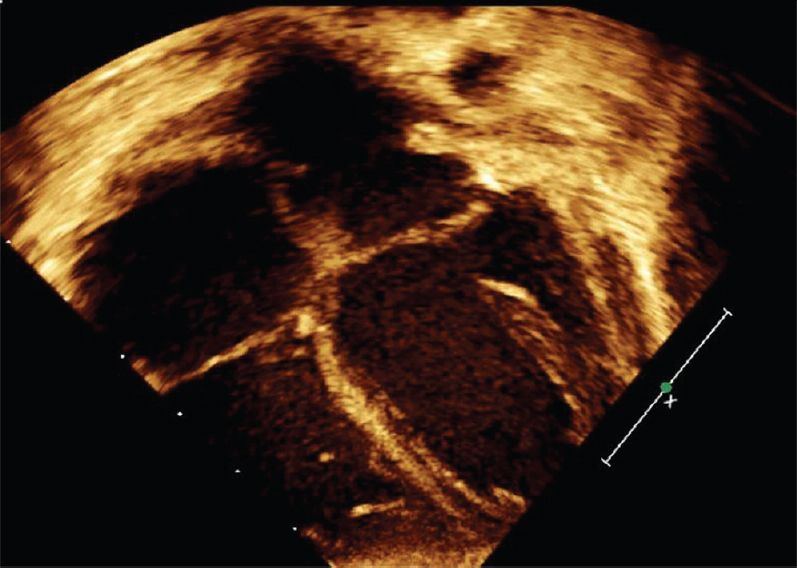 Pseudoaneurysm of the left ventricle: An unusual echocardiographic presentation. Review of the literature. Ann Intern Med 1977;86:430-3. Nair VV, Malankar D, Kothari SS, Das S, Gulati GS, Airan B. Unusual left ventricular pseudoaneurysm in a child after disseminated bacterial infection. World J Pediatr Congenit Heart Surg 2014;5:121-3. Dachman AH, Spindola-Franco H, Solomon N. Left ventricular pseudoaneurysm. Its recognition and significance. JAMA 1981;246:1951-3. Moraes AN, Ferreira AG, Ferreira SM. Left ventricular pseudoaneurysm complicating infective pericarditis. Heart 1999;S2:393-4. Narayanasami R, Raghupathy R, Rajamani G Kumaran V, Diraviraj R, Krishnamurthy P, et al. Thorocoscopic window pericardectomy for pyopericardium. J Indian Assoc Pediatr Surg 2004;9:55-61. March KL, Sawada SG, Tarver RD, Kesler KA, Armstrong WF. Current concepts of left ventricular pseudoaneurysm: Pathophysiology, therapy and diagnostic imaging methods. Clin Cardiol 1989;12:531-50. Frances C, Romero A, Grady D. Left ventricular pseudoaneurysm. J Am Coll Cardiol 1998;32:557-61. Zoffoli G, Mangino D, Venturini A, Terrini A, Asta A, Zanchettin C, et al. Differentiating left ventricular aneurysm from pseudo aneurysm: A case report and review of literature. J Cardiothoracic Surg 2009;4:11.